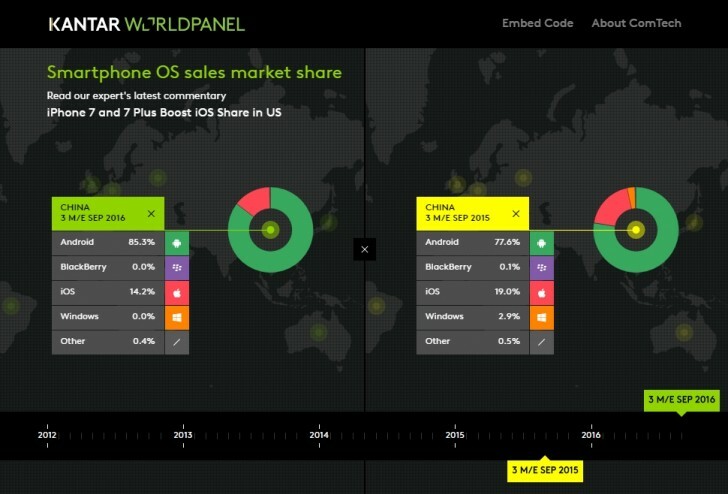 Market researchers Kantar Worldpanel have published their Q3 2016 report detailing smartphone buying trends. The iPhone 7 and 7 Plus lead the way in the US, commanding a 17.1% market share for the month of September, with the 6s generation coming in second. All that leads to an iOS share of 34.2% in the US for Q3, up 5 percentage points from last year's result. Meanwhile, Samsung posted a 4.1pp decline year-on-year, now down to 33.8% share, with Android down to 63.4% altogether (compared to 66.7% for Q3 2015). The proportions are slightly different in Great Britain, though the iPhone 7 still ruled the month of September, claiming 15.1% of sales. The iPhone SE accounted for a surprisingly large 8.5% share of sales in Q3, fueling iOS' 2.4pp growth YoY to 40.6%. It's the only market where Samsung recorded any gains, securing a 30.4% market share. Compare Apple's figures in the Western world to China, and it's not looking as good for the Cupertino company. iOS share went down 4.8pp year-on-year to 14.2%. 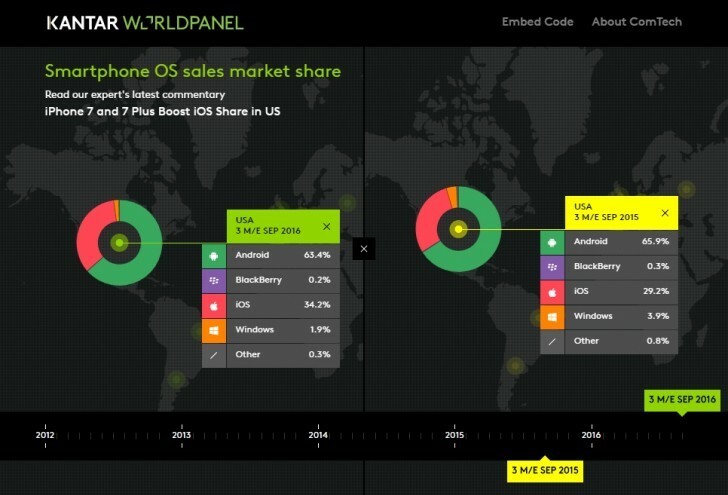 Android, on the other hand, gained 7.7pp to 85.7% while Windows Mobile shrank into oblivion. It sold 10.8m in Q3 2015 not 2016 according to Strategic Analytics, only 7.5m. That is a massive fall of 31% made much worse by the fact the market in China grew by 15%. By anybody's standards that is not dominating the market, but a major downturn.